7.78 points at 23 votes (rank 134). On the way in the green hell. 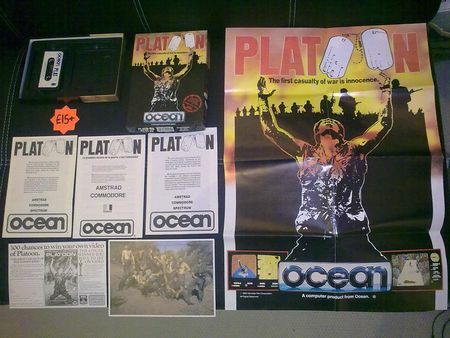 Platoon is a mixture of shooter and action adventure by Ocean Software from 1987. 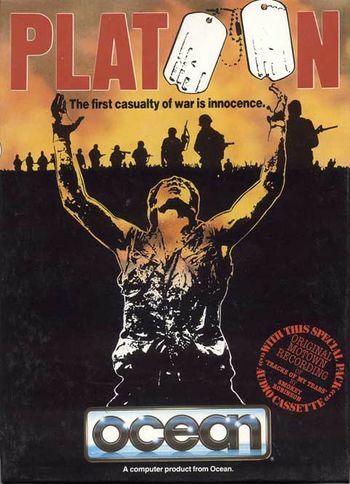 It is based on the anti-war movie with the same name by the US American director Oliver Stone from 1986, in which the experiences of a G.I during his period of service in the Vietnam War and the connected combat missions are told. The game re-enacts the plot of the film loosely in several levels which are loaded one after the other. 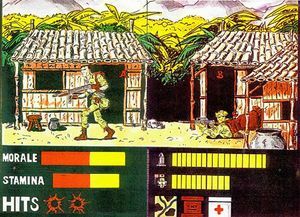 At the start of the game, the player steers a Platoon which has been shrunk to five men through the winding paths of the jungle. The task at first is to find an explosive charge to demolish a strategically important bridge and this way to escape the pursuit of a hostile superiority. 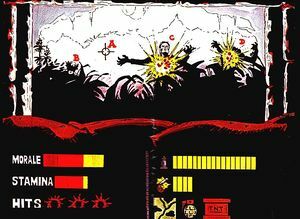 If this is successfully done, a Vietnamese village needs to be searched and an entrance to a secret tunnel complex of the Vietcong has to be found, whereupon the second part of the game is loaded. Now the story is told from the first-person perspective of the soldier wandering through the corridors, who now has to search the numerous rooms for a compass and a flare, before he can leave the labyrinth by an unguarded exit. A nightly assault by the Vietcong follows, which the player has to fend off out of his foxhole. The final of the game is to find the way to a shelter while being pressed for time to rescue yourself from an attack of the US Airforce, who - not knowing that there are still own troups in the target area - bomb the jungle with Napalm. The only shelter has been occupied by the now gone crazy Seargant of the Platoon, though, who welcomes the player with grenades and MG fire. Only if you make it to eliminate the antagonist within the time limit with the help of grenades, the game will end with the trip home to the USA. The graphics in Platoon are almost constantly on a high level. 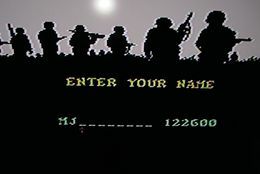 Starting with the loading screen and the title screen, which shows the black shilouettes of soldiers against a white background, it becomes apparent, that the graphics department put their heart and soul in it. The jungle labyrinth gets across effectively the disorientation in such a surrounding: without learning the map by heart you will get lost in no time, as all screens look mostly overgrown to the same degree. Deathly traps and snipers are in some places covered by bushes, so that you permanently have to look where you are walking. The sprites profit from the use of HiRes overlays, as already in Combat School and are therefore very detailled and animated flickering-free and pleasantly. The second level raises the positive impression further and presents itself as the very early representative of the ego shooter genre. Though there is no scrolling in the real sense, but only a number of different corridor images switched one after the other, but the effect to think you move through a tunnel system is successful. Also the folllowing short trench sequence can convince despite its simplicity concerning the gameplay, as it finally does only depict a revamped shooting gallery. In the third part of the game the quality of the graphics decreases visibily. The dark flair from the previous level gives way to a mixture of too coloured jungle graphics on a bright yellow background, which reminds more of a flower shop or a landscape park than of a jungle. Especially disappointing are the sprites of the enemies, which could stem from a ZX Spectrum, same as the highly pixelated end screen of the game. Added to this are the notchy controls and also weaknesses in the collision query can be felt. After the good quality of the two previous parts, this section makes you presume that programmer came quickly close to the deadline for the game while designing and it had to be done especially fast. Fitting the topic, Jonathan has contributed a dark soundtrack consisting of nine tunes, which give the game a corresponding sound frame. The melancholic draging title tune communicates a feeling of suffering and drama and sets the basic mood for the coming plot. The background music of the first jungle level sounds significantly more exhilarated, here also Far Eastern elements can be heard restrainedly. In the second part of the game, however, the really heavy artillery is rolled out, starting with the absolutely dreary tune in the starting screen, followed by a scary track, which accompanies the tour through the tunnel labyrinth and makes the water drops running down the walls virtually appear in your mind's eye. The following scenes also do not stint with the use of horror-like sounds that accompany the happening on the screen almost perfectly. Only for the highscore table did the Maestro let himself get carried away to a sweet langour, which seems a bit out of place. Purists can also play without music, of course, but then they have to do with rather average sound effects, that are limited to shooting sounds and explosions. If the own character is hit by an enemy or runs into a trap, a digitalized scream is played. Highscore chaser can be glad, as the improved version by REMEMBER comprises a retrospectively installed, saveable highscore table. Some scenes from the game. 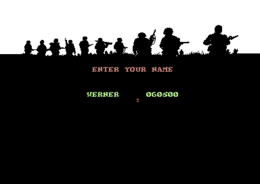 You start the game with a Platoon of five men, displayed as one single G.I., between which you can change any time by pressing one of the function keys. Each soldier has a limited amount of ammunition for the machine gun and some hand grenades to dispose booby traps that the Vietcong (VC) has laid down in the jungle. Further perils are the permanently attacking soldiers of the Vietcong who either jump suddenly out of the treetops or surprisingly open the fire out of shelters. Each G.I. can bare up to three hits by hostile fire or close combat contact, the fourth will cost his live which is shown by a "killed in action" in the selection menu. Booby traps on the other hand are instantly deadly. Additionally, each hit lowers the fighting moral of the Platoon, which is displayed as a diminishing bar at the lower left of the screen. If this bar reaches zero, the game is aborted, independently of the Platoon’s grade of injury. According to the background story, the Platoon is on a retreat from a superior hostile patrol and first has to find an explosive charge to bomb up a bridge and with this be able to shake off the pursuers. If the bridge is crossed without having collected the explosive first, a VC soldier with a flame thrower appears who instantly eliminates the complete Platoon and ends the game. But if the bridge was demolished script-like, the game continues and now a Vietnamese village can be searched, whereby you have to take care at all costs that no civilians are killed, as this will have fatal consequences on the moral of the troop. The village consists of some huts which can be entered to examine the inventory. The aim is to find the trap door to a tunnel system below the village, as well as the belonging map and a torch. But you need to be careful, as some houses are mined with booby traps or a VC soldier lurks for the intruders. If all necessary items have been collected, the second part of the programme is loaded. Passages in the bushes are passed with and , if the Platoon stands below or beneath it. Items in the huts are searched with . 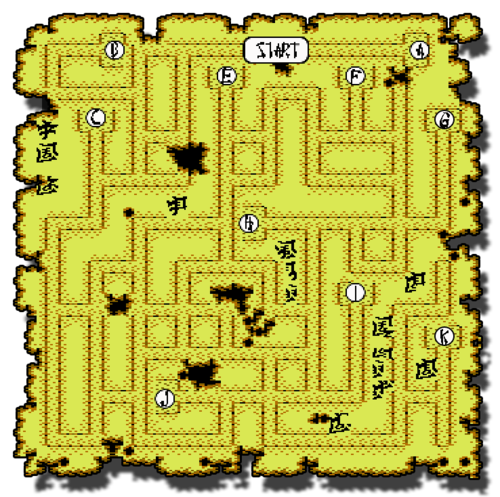 This level is displayed from the first-person perspective of the character and consists of a labyrinth of partially collapsed dead-ends and corridors, that connect the numerous rooms to each other. You have two tries to reach the exit from this labyrinth and you have to have found two flare guns and a compass or else the game will not let you pass.. The map found in the village only shows a cutout of the whole system and switches to the next part when reaching the rim of the map. The own position and viewing direction is shown by a black arrow. This arrow can be moved through the labyrinth with a joystick movement forwards, with left and right you change the viewing direction. If you meet hostile soldiers, the character stops automatically and you can now steer crosslines to shoot the enemy before he shoots you. Here also 4 hits by the enemy mean losing one of the screen lives still left. If you move the arrow inside one of the rooms its contents is shown and the crosslines otherwise used for shooting can now be used to search the inventory, whereby scroll text appears in the lower part of the screen to give information about the results of the search. Here you can find next to the three required items also helpful first-aid kits to heal wounds and additional ammunition. Bonus points can be gained by finding secret documents in some rooms. Searching the room brings out the much sought-after flares. No just do not lose your head! After leaving the tunnel complex through the exit, a nightly assault by the VC on the emplacement of the G.I.’s is made, which needs to be fended off with machine gun fire. By firing the previously collected, limited flares you can illuminate the battle ground for a short time to be able to see the advancing enemy better, which is otherwise only displayed as a fuzzy shadow. Enemies, which are not shot on time, finally reveal themselves by their own muzzle flash, but the player now is in danger to get hit himself. The attack constantly takes up speed until a sufficient number of VC soldiers has been fended off or the player has taken the fourth hit, which means playing through the tunnel scene again. If the attack was fended off, the third part of the game is loaded. The absolute hardness test comes at the end. The hostile attack is hardly overcome, as you hear over the radio that a squadron of the US Air Force is on the way to fly an air strike with napalm bombs over the jungle area where you are located. As it is impossible to call back the bombers, the only chance to survive is to find an appropriate shelter before the whole surrounding turns into a flaming inferno. There are 2 minutes left to find a way through the jungle to the shelter and eliminate Sergeant Barnes, who has lost his mind and is also responsible for the death of Private Elias (one of the “good guys” from the film). Blockages of barbed wire, landmines, snipers and VC soldiers, which the jungle now teems with, thwart the player on his way. On top of that, it is not clear which of the numerous junctions leads the quickest to the destination. The compass on the right in the screen helps a bit to create a map, but the ideal way needs to be found by trying out all possible routes in the end. Oh, and the ammunition is of course also limited. To finally eliminate the crazy Sergeant, his shelter, out of which he covers you with MG fire and grenades, needs to be smoked out by five hits with hand grenades. These hand grenades can be found directly in the area in front of the confrontation. If you win this fight against expectations within the time limit, you will be informed that you will be relieved from your obligation honourably, due to your suffered injuries and number of successful missions. A helicopter is sent out to transport you to your homeland and the game is over. Barnes gets his rightful punishment and you return as a changed man into your home country. Look out for the bushes that cover the way: there could be hidden booby trap. As a precaution jump over these places. Using hand grenades requires much time, in which you are exposd to the enemy without protection. If a booby trap blocks the way, it is most of the time enough to let it scroll out of the screen by moving the character. When you return, the trap is often already gone. When jumping over a booby trap, release a shot beforehand to be able to head off the maybe appearing VC soldiers. Every now and then VC soldiers drop yellow packages with which you can recover an injury and a bit of moral. It should be routed to the soldier with the most injuries. Near the bridge these packages can be found more often. In no case shoot at civilians in the village. It is better to risk being wounded by an enemy instead of shooting an innocent by accident, as the loss of moral has a fatal effect. Always stay on the move, every second that you let pass unused calls new enemies into action. Release short, controlled fire bursts, as the ammunition is empty very fast. The necessary items are in the rooms B, G and J of the map added below. The exit is in room K.
Economize with the ammunition in the dugout and look closely at the movements in the dark. As the flares are not enough, you cannot avoid to allow short phases of darkness between the single flare shots. The fastest possible route to Barnes is to turn left in every screen, except for screens 6 and 10, in which you need to turn right (s. map below). Only try to run to the junction of a screen, when there is no enemy coming at the upper rim of the screen any more. Beware of the snipers, who shoot at you out of a sudden from the side! Always stay on the move during the fight against Barnes and avoid getting cornered by his shots. F: compass, medicine, G: ammunition, H: nothing, I: nothing, J: flares, 2x medicine, K:: ammunition, medicine, EXIT! The version by REMEMBER has all imaginable options for unlimited energy, ammunition, invulnerability and allows choosing later levels and jumping a level by a press on a key. Numerous other versions of the game either do not load the levels correctly or have bugs which are already in the original game, but which were fixed in the REMEMBER version. Game critics from the Happy Computer 4/88. Robotron2084: "An excellent adaption of a film – due to the successful graphics and the atmospheric soundtrack – which makes it to build a real oppressive atmosphere. But this standard cannot be maintained through the whole game: what follows after the really grand second level, seems very disappointing. 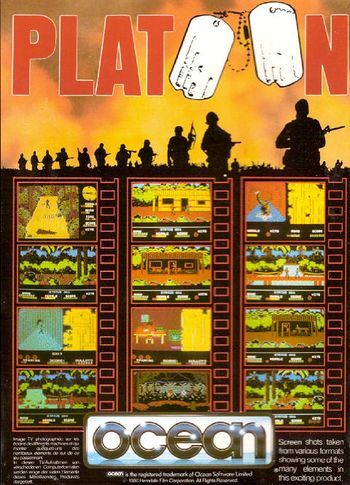 But all in all, however, Platoon is for me one of the best, if not even, the best game, that Ocean Software has ever released. 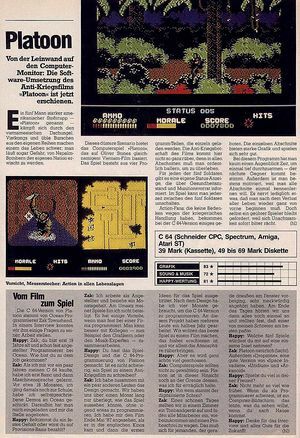 No milestone of the C64 computer history, but a nice example of a very well presented, coherent total work of art (with small weaknesses), which I like playing every now and then. 8 of 10 points." Bamse: "Great game with super atmosphere. The tunnel level is an absolute C64 highlight. The same goes for the music. A must-have!" mombasajoe "Level 1 and 2 offer a technically solid and perfectly playable conversion of the film in a coherent atmosphere. Until then 10/10. The tunnel level is "unfortunately" the absolute highlight of the title, as level 3 is still quite okay as a 2D cross line shooter, but level 4 really does not fit the rest concerning the quality in a negative sense. This is a pity, as up until today exactly this fact is the reason why I could not get motivated to try to play through this title: I like starting to play it, but after the Game Over (in level 3 or 4) there surely will be no second try on the same day." Enclosed to the game was a participation card for a contest, in which you could win a video cassette of the film. The scream that can be heard during the game, stems from the programmer Zach Townsend. For this an own scream contest was held at Ocean, which was finally won by Townsend. 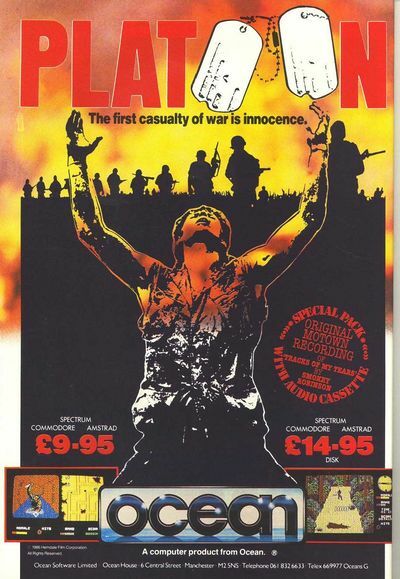 A special UK version contained next to a film poster also a photograph, which showed the film crew wearing the outfit of a US platoon of the Vietnam War and a music cassette with the track "Tracks of my Tears" by Smokey Robinson (Video at dailymotion). 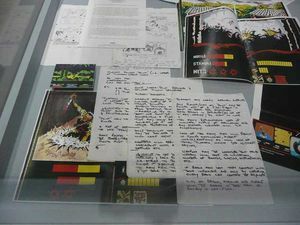 Contents of the "Special UK Edition" of the game. Level 2: the tunnel labyrinth. Front side of the Ocean version of the game. 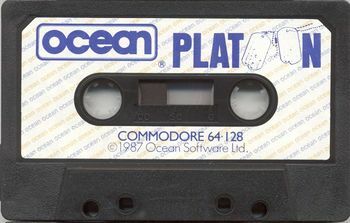 Rear side of the Ocean version of the game. 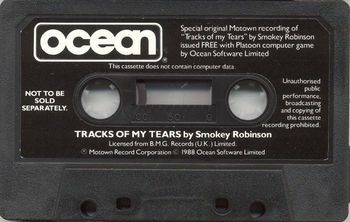 Bonus music cassette with "Tracks of my Tears" by Smokey Robinson.